Spoilt for choice, Michael opted to rock the ‘Douglas double hat’ on the podium. 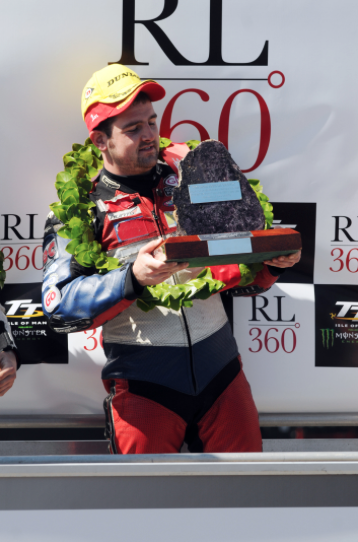 Michael Dunlop took his ninth TT victory when he comfortably won the RL 360 Superstock race giving BMW their second win in four days. Riding the MD Racing machine, Dunlop faced a serious challenge from Monster Energy Supersport 1 race winner Gary Johnson but the Lincolnshire man crashed out on the run up to the Waterworks on the opening lap. From that point Dunlop was able to maintain his lead over second placed Dean Harrison and eventually came home 20.1s clear of the RC Express Racing by MSS Performance rider with Bruce Anstey taking third for Valvoline Racing/Padgetts Honda. Dunlop was quickest to Glen Helen on lap one but it was close as only 0.5s covered the top four riders with Harrison, Johnson and James Hillier all in touch with the Ballymoney man. By Ramsey, Johnson had moved up to second but his challenge came to an abrupt end just a few hundred yards up from the hairpin. He was reported conscious but with fractures and taken by airmed to Nobles Hospital. As the riders flashed through the grandstand for the first time, Dunlop’s opening lap of 129.588mph gave him a 6.7s lead over Harrison with Anstey now up to third and Hillier still holding onto fourth. Conor Cummins and Guy Martin rounded out the top six. On lap two, Dunlop continued to increase his advantage but Harrison was keeping him honest although the margin had more than doubled as they came into refuel, the gap now just under 13 seconds as Dunlop set the fastest lap of the race at 129.778mph. Anstey continued to hold onto third but Cummins, Martin and Michael Rutter had all overhauled Hillier though who had slipped back to seventh. Harrison appeared to lose time at the pit stop but that was clearly not the case as he’d brought Dunlop’s lead down to nine seconds at Glen Helen on the third lap although hopes of reducing it further soon evaporated as the Northern Irishman had moved it back up to 18s by the end of the lap. One rider out of luck though was Guy Martin who retired at Parliament Square. Using his pit boards to control the race in the closing stages, Dunlop duly came home for his third win in the Superstock race and, uniquely, on a third different bike manufacturer while it also extended his lead at the top of the Joey Dunlop Championship table. Harrison equalled his best ever result in second, repeating the runner-up spot in last year’s Lightweight race, with Anstey comfortable in third for the entire race. The battle for fourth was close throughout though and going into the final lap, just 2.7s separated fourth to seventh and in the end it went to Australian David Johnson, comfortably his best ever TT result after a brilliant ride although it was tight – just 0.8s ahead of Cummins, who lost time at his pit stop when the bike refused to fire up. Lee Johnston had his best ever result as well as he finished sixth only 0.2s clear of Michael Rutter whose solid week continued. Dan Kneen had another good ride, finishing in eighth place while Peter Hickman took a brilliant ninth place to be both the first newcomer and first privateer home with John McGuinness completing the top ten. Hickman increased his personal best lap to 126.545mph. Horst Saiger was the second privateer home in 13th just ahead of Russ Mountford, James Cowton and Ivan Lintin. Lintin’s 15th place maintaining his lead in the TT Privateer’s Championship with 56 points, six ahead of Hickman. Joe Faragher was taken by Airmed to Nobles hospital following an incident at Joey’s and reported to have sustained fractures.